For the longest time, email has been used as the main channel for engaging customers. And while it has proven to be effective for many businesses, more and more enterprising individuals and firms have focused on Facebook Messenger. There are certain advantages of Facebook Messenger marketing over email and other traditional communication channels. Sending messages to current and potential clients through Facebook Messenger is a practical marketing approach. After all, sending messages through the Messenger app yields higher open rates and visibility than emails. With Facebook Messenger marketing, companies can start automated, two-way communication between their clients. Instead of sending messages to an email inbox that can be filled with distractions, brands can send push notifications to their customers. Moreover, there are more than 1.3 billion individuals around the world who use this popular messenger app every month. The number is growing every minute, further enhancing the viability of the Messenger as a customer engagement tool. can send messages to these buyers. The message may be a gentle reminder or simply asking if the customer has any questions about the purchase. Merchants can also use the app to send order receipts to their customers after completing a purchase. This can also be an excellent way for businesses to thank their buyers or customers. Doing something special like this can go a long way towards strengthening the business-client relationship. Or the app may be used in sending a shipping message, giving the buyer a convenient way to track the order. It’s also an effective way of establishing a customer’s trust. 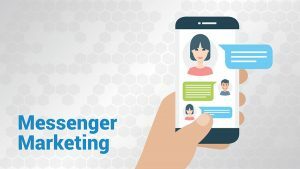 With these advantages and uses of Facebook Messenger marketing, it is no wonder why many companies are focusing more on it.